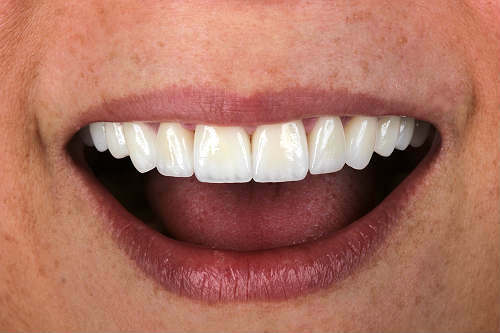 We're looking at the before and after pictures of a full upper-mouth dental restoration. Wouldn't you want a new and more attractive smile, if you had teeth like these? For this case, the dentist ordered two different materials. 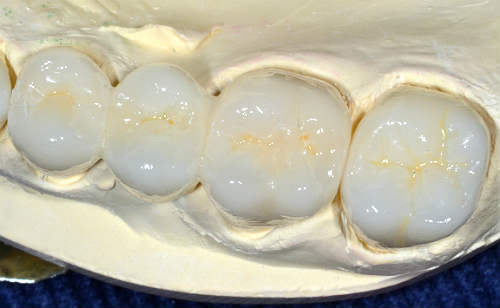 Why use different porcelain material for this dental restoration? Each porcelain material has its strength and weakness. 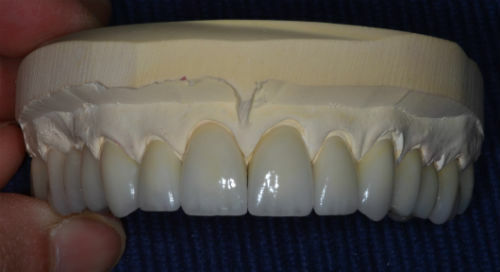 So, in a complex case like a full upper-mouth restoration, it can be common to use different ceramics to complete the case. It would also depend on the patient's unique needs, oral health, and desires. Here we used e.max (pressable lithium disilicate) for her anterior crowns, and Zirconia (zirconium dioxide) for her posterior bridges. 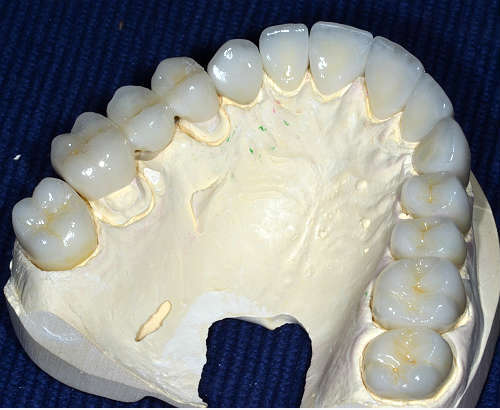 The combination of these two materials, used in specific areas of the mouth, and on particular restorations (anterior crowns vs. posterior bridges) gave this patient the best overall level of aesthetics, strength, durability, and function. 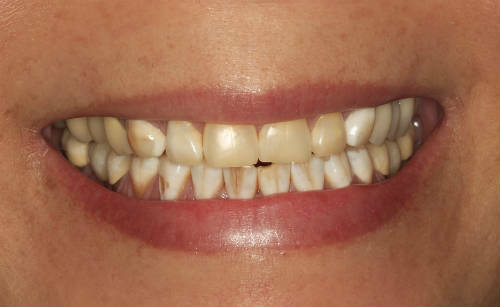 For the anterior teeth (the front teeth), the dentist wanted to create single crowns. Strength and aesthetics is very important for this area of the mouth because that's everyone sees during conversation. Therefore, we used e.Max (pressable lithium disilicate) because these are some of the advantages it provides. 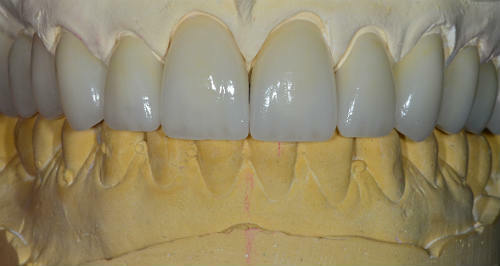 For the posterior teeth (rear teeth/molars), the dentist needed bridges. Although e.Max is a strong and resilient material for single crowns and veneers, it is not recommended for long-span dental bridges. In the image below, you'll see a three unit bridge on the left, and a single posterior to the right (the last molar in the image). In this part of the restoration, we went with Zirconia (zirconium dioxide) to craft the bridges. Zirconia has the advantage for making all ceramic dental bridges (and under the right hands, it can be made aesthetically pleasing as well). The patient is completely thrilled with the results! Luckily today, we have many techniques, materials, and technologies to give patients the best results; both natural look and function, possible. And better yet, good technicians always perfect and refine their craft, the technology in this industry evolves and improves, so patients can look forward to even better care and aesthetics in the future.